Hi all, I like Folsom and don't really know of a better place to live in Sacramento (as safe, with as many nice bike trails/paths, convenient shopping and errands running). Rocklin and Roseville are too far away from work and I overall prefer Folsom over them. Elk Grove seems like a risk in the long-term because I hear more about bold home break-in attempts. I'm similarly concerned about safety in Rancho Cordova and Natomas. So, to me, the only other place to consider is EDH, which is just a freeway exit away. I'm looking to buy a house or condo in Folsom or EDH provided I can find reliable public commuter service that can get me to/from work in Downtown Sacramento on-time every day, within ~30 minutes or so. If I live in Folsom, I'd have to take Light Rail and have been told that's a 50-minute ride. If I live in EDH, I would be able to catch a commuter bus at the Park & Ride and it looks like about a 30-minute ride. 1. Is any EDH resident familiar with the commuter bus service Downtown? Can you share more information about the experience (is it crowded, do you have to stand up, is it on-time, does it ever miss a run, etc)? 2. 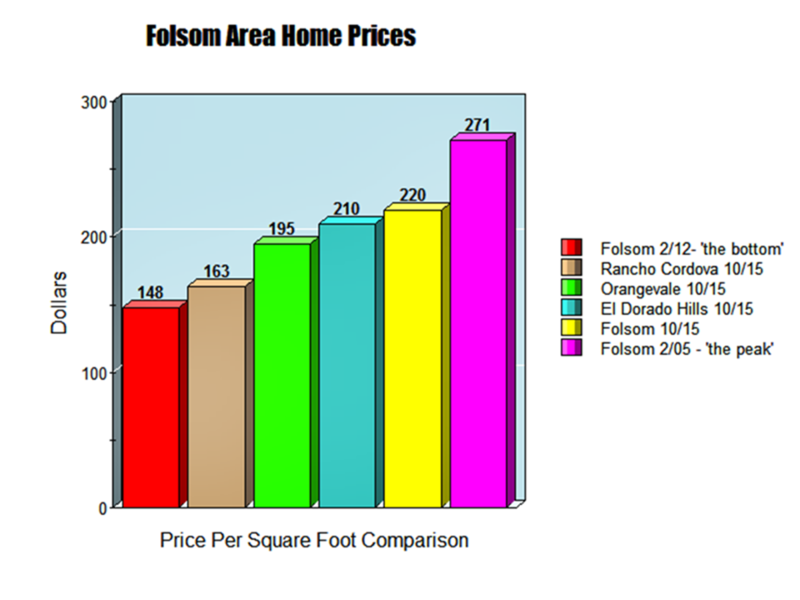 While I'd prefer to buy a house, since prices are higher in Folsom and EDH than say Elk Grove, and I believe we're currently closer to peak sales prices than not, I've been considering holding off from buying my "dream home" until prices fall again, and they will at some point. In the meantime, rather than renting an apartment, I'm considering buying a condo to hold me over until the next real estate decline. I would be able to put down the minimum amount thus saving the majority of my down payment funds to buy a house in the future when prices go down. Later I could perhaps rent the condo out. In this way, I would be paying down a loan on a condo/building some equity rather than burning through all the money on renting. The condo would hold me over until the next housing market decline. Does this sound like a sound strategy? Are there any good condos in great areas of EDH? How do they compare to the condo options in Folsom? I can't speak to the transportation issue, but I CAN talk about real estate. No one knows where prices will be, nor if or when they will fall. I'm told that interest rates are expected to remain low, household formation continues, unemployment is down, and the other Northern California destinations either don't offer the amenities of Folsom or are too high-priced, so if all is true, that should keep the Folsom housing market strong for the foreseeable future. The bottom of our market over the past 15 years was $148 per square foot, in February of 2012. The top was $271 per, back in August/September of 2005. Is your strategy a sound one? It could be. Prices will cycle down some day. We just don't know when nor by how much. It's difficult to time the market, and we don't know where the bottom is until it passes. As for condos, I'd prefer condos which were designed so rather than apartment conversions. There are some nice ones here in Folsom, such as Esplanade, Vessona and Madrone (and a few others). Overall, I prefer Folsom, but the Eldo Hills condos behind Town Center off of Valley View are very nice as well. Folsom just seems to have more overall amenities. The builder of the Madrone condo's in Folsom also built a much smaller complex in EDH. I almost bought in Madrone but quickly backed out when I realized how big & tall the complex was while walking around. The EDH version is off White Rock & Valley View Rd. I'm sorry, I dont remember the name, and I cant seem to find it online. There are other condos available in the same general location near Town Center, and then also along El Dorado Hills Blvd. I don't know anyone who uses the commuter buses, but I do believe it is sit down only. It's a long drive. I believe they operate much like the commuter buses that go to Marysville/Yuba City. FYI - there ARE home breakins in Folsom also. The Complex is LeSarra and most of the complex is what the owners call Luxury apartments../. There are some condos, but not sure if it was build as condo and then converted to apartments as many did or build at apartments and converted to condo and then those that did not sell ( most) converted back to apartments. It is one of 3 very large complexes on Valley View Pkwy. One of them ( the lower one) has some Section 8 and HUD housing and another is just nice apartments (Vineyards) and then there is LaSarra.. I know this as my walking partner lives in the Vineyards. I do note that some very nice cars come out of LaSarra. As far as I know, there are no other condos near the EDH town center unless they are a ways down Lathrop road. There is a mobile home park and seems nice and often has places for sale. Thanks, they were condo's at the time I looked. They are the exact same models as Madrone so I don't really get why they were considered luxury. Other than the cost, additional upgrades, smaller complex and perhaps a better view.